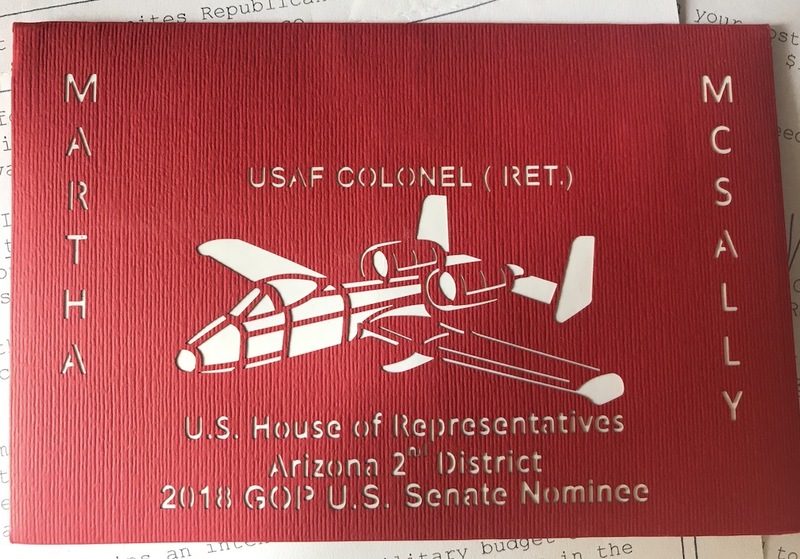 Col. Martha McSally wasted her time and money writing to me, but I’m glad she did, because, boy, is this ever a plane tale! It all started at my mailbox in the post office. Nestled in a pile of bills and mail order catalogs from outfits I’ve never ordered from is a thickish envelope from Arizona. Inside is a letter and a card. 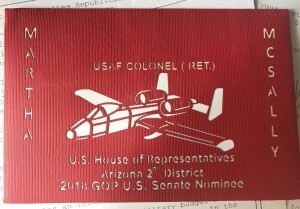 The card is a thick, lovely, deep rich red with a cut-out of an A-10 Warthog on it. I’m intrigued. I open the card, and like the pop-up books of my childhood, the A-10 takes flight. Ah. The good Colonel is running for the U.S. Senate. In Arizona? So why the heck is she writing to me? The dead frequently vote in my state of New Mexico, but neither our living nor our dead have reputations for voting in other people’s states, even ones a short flight away. Her letter to me says she served in the USAF for 26 years and was the first female fighter pilot to fly in combat; and that she then went on to log a total of 350 combat hours. She’s also a U.S. Congress Woman. Impressive. But I wonder if her campaign has filed the wrong flight plan in contacting me? I read on. Then she asks me for $2,700. 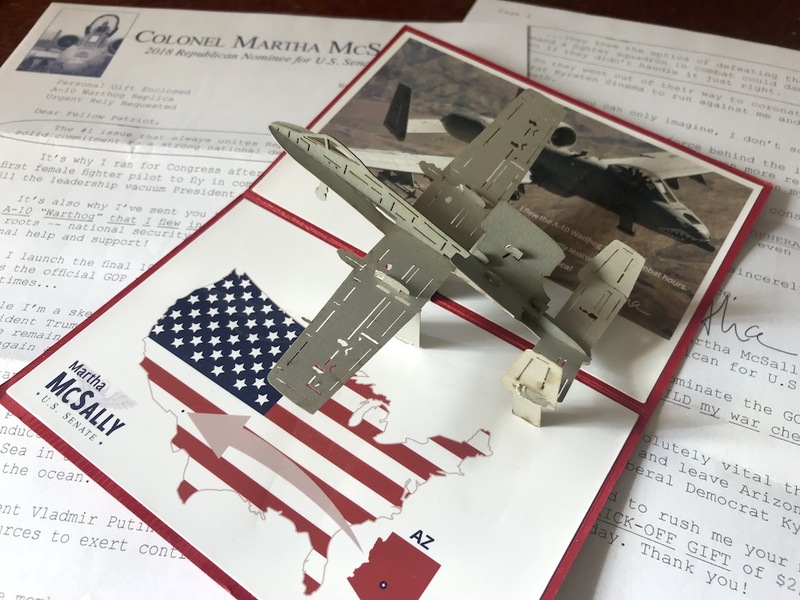 In fact, not only does she ask me for $2,700, she asks me to “rush” her a check before I even put her letter down to prominently display my new pop-up A-10 Warthog. That struck me as an odd amount of money to ask for, but it turns out that’s the maximum that the Federal Election Commission allows youto give a candidate in each of his or her elections; and she’s fishing for the most money she can get. She says that it cost her over five million dollars to “dominate the GOP primary” and she needs to rebuild her war chest for the next phase of the battle. Ya gotta love all this military language. I did prominently display my new pop-up A-10 Warthog, but I didn’t send her a check. Now, here at Plane Tales we follow the old rules of the Western stage coaches: We don’t talk politics. But I will say this: As a general rule I don’t donate to political campaigns. I think there’s too much money in elections, and I’m not going to make the problem worse. Even if I were going to make an exception, I don’t think it would be to help fund a race in a neighboring state. But I will say: Thank you, Colonel, for your service to our nation. And thank you for the cool card. This entry was posted in Fly Fun, Plane Passion, Plane People and tagged Plane Politics by admin. Bookmark the permalink. The Colonel must have tag the wrong N number! I live in Arizona and I didn’t get a card.